All the Tools & Support You Need to Make a Killer Website Making a website or blog with GreenGeeks is easy with our step-by-step guides, tools and 24/7 expert support. We'll give you everything you need to make your website and be successful online. This guide gives you everything you need to make a fabulous website in less than an hour! This guide was built with beginners in mind. Detailed, but easy to follow. You'll have a professional, mobile-friendly website up within an hour. This guide is updated frequently to give you only the best information. Mobile ready with the use of responsive themes. Easily integrate a shopping cart to sell your products. Get found in Google easily by new customers with Search Engine Optimization integration and tools. Get access to our friendly and knowledgeable support team around the clock via e-mail, live chat and telephone. Ready to make a website in 2019? Thanks to advances in technology and programming, creating a website today is far easier than it was at the turn of the century. This is especially true if you pick the right platform. In reality, you don't even need to know how to develop code such as HTML or PHP. However, learning these elements later could help you customize your site to your liking. In the long run, though, even the most novice of website developers can create something spectacular. In this guide, I am going to show you how to make a website using some of the best tools on the Internet. By the time you're done, you will have an online presence ready for visitors. Unlike the days of old, you don't need to manually code a website to make something amazing. In fact, you can choose from a myriad of platforms to help you construct a website without entering a single line of code. Choosing the right platform is going to center around your own desires. Do you want to build an online store to sell goods? Are you looking to entertain others with your blog? It's all a matter of what you want to share with the world. More than 50% of users on the Internet are mobile. If you want to build a successful website, you need to make sure your site is ready for smartphones. Some website builders offer easier and more efficient ways to create sites for both desktops and mobile devices. Content management systems come in all forms. Some are easier to use for beginners while others are more geared for advanced online coding. Your current level of skill is going to drive which platform will be the best for you. Don't feel bad if you need help building your site. Everyone starts from the beginning, and the platform you choose may or may not have the best support system. If you need help, you want to know that assistance is easy to access. So, What Kind of Platforms are Available? The Internet is full of development platforms to build websites. The hardest part is picking which one will suit your needs the best. Here are just a few I find the most useful. WordPress is by far my favorite content management system. It can act as a blog, eCommerce site or even a community hub if you want to create a social channel. 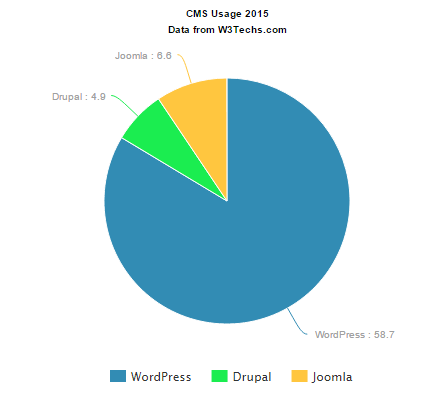 Joomla is a good system that is almost as flexible as WordPress. The biggest difference is the amount of coding you'll need to learn to make certain adjustments. Drupal is a decent system, but it requires far more coding and has less support than systems like WordPress. It's more difficult to set up and organize as opposed to WordPress or Joomla. Prestashop is a platform designed specifically for eCommerce. It's a good system with a free license. However, some additions can be quite costly to add later on. Another eCommerce platform, CubeCart offers a great deal of flexibility and options to get started. Like Prestashop, though, it also can cost a lot to add new features. This is only a handful of the systems you can use. At GreenGeeks, we use Softaculous. It's loaded with different kinds of website builders you can add with just a couple clicks of the mouse. If you're new to website development, I suggest using WordPress. It's the easiest to use and often faster when creating a new website. WordPress is one of the most versatile website building platforms on the Internet. You can customize it to be virtually anything you need. It's flexibility and ease of use are reasons why it controls nearly 60% of the marketshare for content management systems. WordPress automatically adjusts itself depending on the visitor's resolution. This means you don't need to make a lot of extra changes just to make sure your website appears nice on a smartphone. Many free themes you can get for WordPress take advantage of this quite nicely. You don't need to enter any coding to get WordPress to do what you want. Through the use of themes and plugins, you can quickly develop the perfect site in mere moments. However, it's also easy to customize if you have coding knowledge. It's perfect for users of all skill levels. Because WordPress is so popular, finding help for virtually any aspect of the application is easy to come by. Forums, tutorials and more are easily accessible. For example, GreenGeeks has an ever-growing list of "How-Tos" for WordPress covering a wide scope of features. One of the most important aspects of WordPress is the fact that it's free. After installing it, you'll have one of the most powerful and feature-rich systems on the Internet driving your website. The next step is finding a good web hosting provider and coming up with a good domain name. Both of these elements are vastly important if you want to build a website that is successful. Your domain name is a unique address which points to your content. Think of it like being able to name your house. It's how visitors will find your site and explore its contents. You need to have a good strategy if you want a successful site. Does the name match the content? You wouldn't want to name a website "BobsChickenBarbecue.com" if you plan on building a vegan website. Is the name of your site short and sweet? The shorter a name is, the easier it is to type. A long name could lead to misspellings or avoidance from users. Is the domain name easy to spell? A simple misspelling of a word in the name could cause traffic to go elsewhere. Are you using the right domain extension, like .com or .net? Some extensions will not be available to you depending on where you live. Today, there are a slew of extensions available depending on industry and purpose. Be creative. Coming up with a good name for your website is often fun if not frustrating. Every time you think you have a good one, someone already has it. However, that's easy to get around with a bit of imagination. If you find yourself stuck trying to find a name you can try using synonyms in the name. Sometimes abbreviations are effective such as "cdc.gov." The important thing to remember is your domain name needs to be representative of your content or business. Deciding on a hosting plan lays the groundwork for building your site. Think of it like buying a plot of digital real estate to build your online structure. GreenGeeks has plans available that range from maintaining a simple blog all the way to more complex and larger corporate needs. For new developers, I suggest the web hosting package we offer. It's the most cost-effective for beginners and comes with all of the tools you'll need to succeed. This also includes a free domain name, which can run you around $15 per year depending on what registrar you use. GreenGeeks won't ask you for additional payments to unlock certain features. Personalized email, web space, bandwidth, shopping carts and more are all available to you regardless of what you want to build for one low price. And if you need to expand beyond your plan, we can help you upgrade and scale to your needs. For instance, what if your eCommerce site grows beyond your limits? It's not a problem at all as we can help you expand your digital real estate to accommodate your visitors. When you're using GreenGeeks, you're also doing your part to help the environment. We use renewable energy sources to help power our data centers, which means your website has a carbon reducing impact on the environment. Once you have your domain name and web hosting account set up, it's time to install WordPress. You have two different methods available: automatic and manual. I'd suggest using the automatic method simply because it's easier and much faster. We use Softaculous to install WordPress and many other management systems. It's a user-friendly system that takes a lot of the work out of setting up the platform. It will do its own databases and give you control over admin accounts and passwords. Softaculous is accessible in the cPanel dashboard from GreenGeeks. If you're more hands-on, you can also install WordPress manually. This is more involved as it requires downloading WordPress, uploading to the server, creating your own database and running the install app. Although it's more time-consuming than using Softaculous, it's not overly difficult. In fact, installing WordPress manually is quite easy as long as you follow the steps closely. Just keep in mind the time it takes to download and upload WordPress will be dependent on your Internet speed. A theme is the actual appearance of your website. It will govern over things like colors, where blocks of information are placed and sometimes include tools to customize the look. When deciding on a specific look and feel of your site, you should consider the following. Niche sites often have the highest rate of success for a specific audience. For example, a website centering around the best places to go fishing in the United States would garner traffic from those looking for good fishing spots. When you focus on a particular topic, you want your layout to accentuate the content. Colors, images and even the font can play a part to give the material you write a certain aesthetic. Do You Want Something Free or Premium? In WordPress, you have access to a wide scope of free themes. A lot of these are quite feature rich and easy to manage. However, a lot of people like the idea of purchasing premium themes. These paid-for layouts often come with tools and functions to provide more in the way of customization. I would suggest using a free theme for now. Once you get used to customizing and how themes impact your site, you may want to buy one to engage your visitors even more. Managing WordPress themes is relatively simple, especially if you do it through the admin panel. All it takes is a couple clicks of the mouse and you can alter how your site looks near instantly. If you don't like the theme, you can quickly change it back. One of the reasons why WordPress is so popular is because of the vast number of plugins available. These are small apps you can install to give your site more functionality. For instance, you can install a FAQ addition to give a professional look to a Frequently Asked Questions page. Here are five essential plugins I suggest installing. Each has a specific purpose and will play a role in maintaining your website. WordPress comes with a good text editing system for creating content. However, TinyMCE Advanced greatly expands what you can do when writing. Essentially, it turns the WordPress editor into more of a word processor by giving you access to more than 30 different text tools. Every website owner needs to pay attention to search engine optimization. It's how your content is found on the Internet in most cases. Yoast SEO not only helps score well in sites like Google, but it also teaches you how to write more engaging content. Cyber security is an important thing to think about. Wordfence Security gives you some of the best tools to keep your website safe. It will monitor outdated plugins, block access from blacklisted IP addresses and act as a firewall to keep your data protected. It's also free. Jetpack now requires a free activation of a WordPress.com account. However, this plugin is full of useful modules such as Proofreading. It also has Publicize to share your content on social media. It's kind of like a Swiss Army knife for WordPress as it has a lot of useful functions. Google Analytics is one of the most popular tools for tracking how people view your site. The Google Analytics Dashboard connects your WordPress site to Google for proper tracking. It also displays your traffic in your admin panel of WordPress in real-time. It's very useful if you want to plan content strategies or just see how people are accessing your content. Once WordPress is installed and you're ready for visitors, it's time to make some content. After all, people need something to read. Let me go over three important parts of creating content in WordPress: pages, posts and menus. Knowing how all three of these function will make a big difference in how you write. It's important you learn how to create posts and pages in WordPress. It's easy, but there is a big difference in how these two are shown on your website. The Pages of WordPress are more useful as static information. For instance, an "About Me" page or putting up a contact form would use pages. This is separate from the regular content you'll write and are often placed in the navigation menu. Think of pages as content that doesn't change. The content of your WordPress website will consist mostly of posts. These are articles you'll create so people will visit. For instance, our WordPress tutorial site consists of many posts in WordPress. If you write once per day, posts are most likely what you'll create. WordPress comes with an easy tool for modifying your menu items. Using drag and drop, you can move posts or even pages into the navigation bar of your site for easy access. Some will even include outbound links to other websites. You want to keep the clutter down on the navigation menu, though. Too many links and elements can be distracting to visitors and could hurt your site's performance. Now that your website is ready, here are a few extras you may want to consider. You can operate your website any way you like, but here are a few ideas to get you started. To get the most out of WordPress, you should tweak the settings. This area controls things like time zones, how comments are handled, date formats and much more. I suggest going through each tool in the Settings area of WordPress and make adjustments to fit your needs. If you don't know what a certain tool does, don't fret. You can simply leave the settings as-is for now and come back to it later. However, a large portion of these settings is user-friendly and easy to understand. You have access to many ways to make money from a website. WordPress handles most of these methods with ease. The more common ways are using AdSense and affiliate marketing links. Either way, you can start generating income if you can pull visitors into your website. Another exceptional good method to make money from WordPress is starting an online store. This is when you turn the website into a place of commerce. Thanks to various plugins, you can start selling goods today. How can you expect people to visit if they don't know the website exists? This is where marketing comes into play. Sure you may have a few visitors come in based purely on your content, but it pales to what you can have by marketing. Social media marketing is a popular method of gaining traffic. It's when you connect with people on sites like Facebook and Twitter and convince them to visit your website. In fact, it's easy to succeed if you use some of the best tools for social media marketing. Email is still one of the most cost efficient forms for online marketing. You can connect to a wide audience with little effort and draw in a crowd with the right campaign. All you really need is good email marketing services to expand your practice. Operating a website in 2019 is relatively simple. With WordPress driven by excellent hosting, success is only limited by your own motivation. And if you ever need assistance, our support team is experienced and is just a click, call or email away. Get the most out of your online experience and build something you can be proud of. Start Making Your Website Now Risk Free for 30-days!